There’s a showdown in the Wicked West; and you’re all invited. The truths of Zelena’s past are revealed, and though not as sad as other evil back-stories, remember. She’s not evil; she’s wicked! So let’s take a trip to the Emerald City and meet our good girl turned stalker turned wicked. 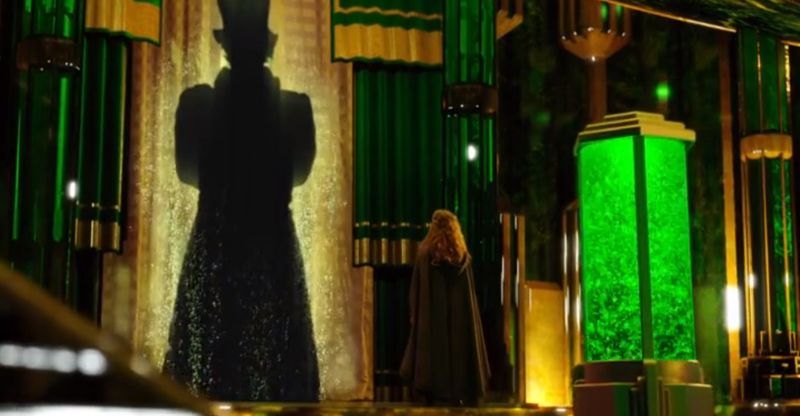 One of the most interesting ideas behind Once Upon A Time is the notion that “Evil isn’t born, it’s made.” Although, where does Wicked fall into this? Using Zelena as our example, let’s try to figure this one out. With her biological father still unknown, we start with Zelena being adopted by a young couple after she was swept up by a tornado and dropped off in Oz. While the mother seemed loving, the father feared Zelena and her magic, which she was able to control very well from even infancy. Some time after the mother’s death, Zelena’s father curses his daughter out when she mistakenly cuts him and uses her magic to procure a handkerchief for him. With such an oppressive father and no one to love her, she traveled to see the Wizard of Oz and learned how she was unwanted by her mother in favor of Regina. Despite the wizards warning, Zelena began to covet everything in her sister’s life and wished it to be hers. This ultimately leads to her being expelled from ‘Rumple’s School Of Magic’ because she can’t control her jealousy. With Rumple also being the thing she cherishes most, it is impossible for her to cast the curse without killing him. Zelena might have had a hard early life, but she left her parents house still the kind girl. When she learned of her sister, rather than try to meet with her and have some kind of family, she immediately put all of her problems on Regina. Rather than work to prove her father wrong, she has become exactly what he accused her of being: Wicked. With so much potential and ability to do good, she let her father’s unfounded and irrational fear of her become her true identity. With Regina, Rumple and Hook we find villains who only became evil because of someone taking something dear to them. Zelena never lost anything. She started from very humble beginnings and had every chance to rise up, but rather than try she saw Regina – the sister she never met – as solely responsible for her lot in life. She never once imagined what Regina gave up being Cora’s daughter. After being confronted with Zelena’s shocking revelation, Regina takes another look at a letter she found years earlier. The letter was from Rumplestiltskin to Cora and spoke of how he found her first born. That this child was the strongest magic user he had ever seen, better than even Cora herself. No matter how little she thought of herself, Regina always came back to this letter to give herself strength. But it was all a lie. With Zelena being Cora’s first born, Regina knows she can’t beat her in a magic fight. If the man who taught her everything she knows about magic says Zelena is stronger, then what chance does Regina have? Her only chance is to use the only thing Cora ever showed her. Regina ripped her own heart out before the fight and gave it to Robin Hood for safe keeping. This turns out to not only be a smart move, but also the decisive one. Zelena wants Regina’s heart for her grand plan so giving it away was her best bet. It also seems as though Robin Hood is acting on his own – and not being control – so I hope he can keep Regina’s heart safe (in more ways than one). With Zelena possessing an item that represent Charming’s courage and her desire to take the Evil Queen’s heart, it looks like my joke guess about heart, brain and courage might have been spot on. Though what does she need them for? I don’t see a tin man, scarecrow or lion anywhere nearby. It turns out Zelena’s master plan isn’t to cast another curse, but rather for a second chance. She wishes to go back in time and change the past so that Rumple would choose her. So that Cora wouldn’t abandon her. So that she could have all her happy endings and leave Regina with nothing. We clearly know this plan would be spoiled sooner or later, but you have to wonder what new doors this opens. I swear if this opens up the door to revive Neal I’ll be upset. It seems like everyone can die and return (Blue Fairy, Rumple, Neal) – all except poor Sheriff Graham. So buckle up, because where we’re going, we don’t need roads – except a yellow brick road of course. Speaking of past men from Emma’s life, it turns out that Walsh was actually Oz, The Great and Terrible. Despite him helping her and giving her magic silver slippers, Zelena still transformed him into a flying monkey – the first actually – to do her bidding. Although what about new men in her life? This episode we saw Hook offer to spend some time with Henry. Now maybe he’s changed or maybe its Hook’s presence, but I actually liked Henry in this scene. Hook and Henry had a great dynamic. Neal was in a sense like Hooks adopted son when they first met, but Henry fits that role much better. This also was a huge WIN for any Captain Swan fans out there. With an episode full of showdowns and origins, we now await the season finale in a few weeks. Will they be off to Oz? Off to the past? It seems pretty slim that these two sisters could ever reconcile unless they met someone with a much steeper power. With Oz’s revelation that Rumple is the most powerful wizard in all the realms, it leads one to think the next opponent will be beyond magic. Perhaps a deity – such as Ursula. With Ariel returning next episode the notion is always there that we might see that sea witch sooner or later. Not this season for sure, but next perhaps. Either way, let’s finish with season first. So get ready for a Hook-centered episode next week and I’ll see you all then!